IMPORTANT NOTE: Submissions cannot be paper-based, you must fill out the information using this online survey. BEFORE YOU BEGIN: This application contains 20 items and requires that you have specific organizational information including GPA training numbers for 2017 available before you begin. TIME TO COMPLETE: Survey will take approximately 1 hour to complete. To save you time, please review the PDF version of the application prior to starting your submission so that you have all your information readily available. See our email to you for the PDF version of the survey or download it directly from this site. Submission must be received no later than midnight May 31, 2018. Selection committee review will take place in June and award notification will be sent out in July 2018. 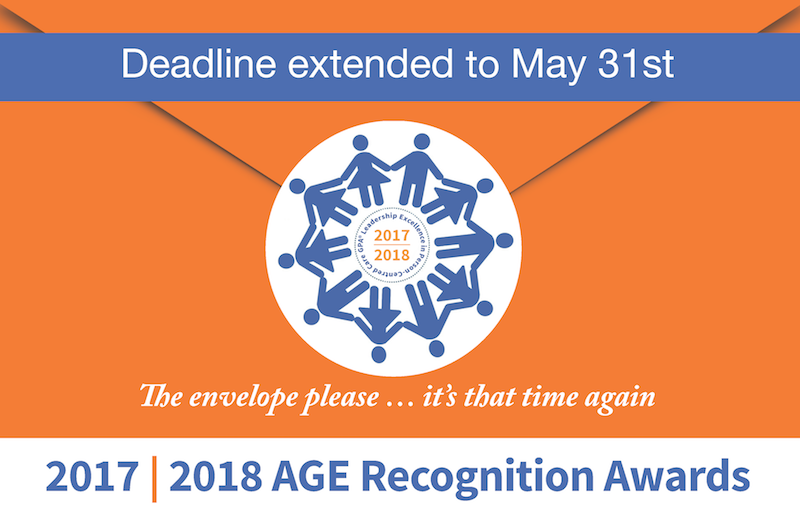 AGE developed this award to recognize both an organization's exceptional continuing commitment to using Gentle Persuasive Approaches within the organization at the point of care, as well as its ongoing efforts to support and ensure sustainability. In order to be considered for this Recognition Award, please fill out the following application with submission of the supporting documentation as outlined. Answers are weighted by points. • Organizational Certificate of Recognition. • Formal recognition on the AGE website which may include an organizational profile, including logo, names of GPA Certified Coaches within your organization, description of your organization and photographs of GPA in action on your site. Featured profile on AGE's social media platforms. • Time-limited promotional discount on purchase of GPA-Recharged booklet packages. AGE Inc. requires your permission to post any content contained in the submission to use as testimonials or to highlight/promote examples of an organization's successful implantation of Gentle Persuasive Approaches within AGE's own marketing and/or promotional ventures or for any purpose that promotes AGE's mission and vision (see Item No. 21). 2. This year, you can see the weighting (points awarded) for each of the responses you provide to Questions 16 through 20. This will be helpful to ensuring all of your answers are comprehensive as possible. (TIP! We love real-life stories about GPA implementation … successes, techniques, novel ways you have come up with of implementing GPA, methods you use to promote GPA in everyday practice and plans you have made for sustaining GPA). * 7. How many beds/patients/residents/clients does your organization service? * 8. How many paid staff are employed? * 9. How many volunteers does your organization have?